Are we verging on another “Bear Stearns” moment? That is, is the canary in the coal mine of the next crisis ready to keel over? Today we don our mining gear… descend into the dark, doomy shaft… and report worrisome findings. First we throw a penetrating beam of light down another deep black hole — today’s stock market. The Dow Jones plunged another 400 points today. The S&P fell 45, while the Nasdaq took the worst of it today — down 219 points, or over 3%. Details tomorrow — depend on it. Bear Stearns entered this world in 1923. It withstood the mighty gale of ’29 six years later. But it could not endure the subprime mortgage crisis of 2007–08. Bear Stearns had hitched its fortunes to the housing boom… like a gold miner ties its future to one primary mine. But in September 2006 the first traces of carbon monoxide came seeping in, when housing prices began giving way. By December 2007 Bear Stearns announced its first loss in 80 years. One month later Moody’s downgraded its debt to junk bond levels. The thing finally went over in March, dead… the first fatality of the financial crisis. This colossus of American manufacturing breathed its first in 1892. Through all economic seasons of American life — winter, spring, summer, fall — old reliable stood good and tall. As recently as 2001, it was the most valuable company in all of existence. The grimy toil of the factory floor was for suckers, it decided. It put aside its overalls and its lunch bucket… bought Armani suits, slicked its hair, began munching sushi… and headed for Wall Street. It went chasing after the fast buck — and the easy buck. It became more bank than manufacturer. The getting was good… until it wasn’t. The 2008 crisis nearly cleaned it out. It has gone on one leg ever since. And the limp has worsened over the last year. Its stock has plunged over 50% this past year alone. Last month S&P downgraded its debt to BBB-plus — three thin hairs from junk bond status. Of what fallen American giant do we write? None other than General Electric. The company whose bulbs lit the world and whose jet engines conquered the aerial ways, the company that survived the Great Depression, the 2001 collapse and the 2008 meltdown… is in a bad way. Were you aware GE presently seeks to divest itself of the very lightbulb business Mr. Edison created? “When many people think of GE, they think of America,” says John Inch, a Deutsche Bank analyst who covers GE. “It’s hard for them to understand how this thing fell apart so quickly,” he adds. Like much of corporate America, GE took aboard heaps of cheap debt after 2008 — it presently groans and sags under $115 billion of it. In all, U.S. corporate debt swelled a preposterous $2.5 trillion post-financial crisis — some 40% higher than its 2008 summit. All was peace as long as interest rates held low. Corporations could put cheap debt to the service of stock buybacks — a principal source of helium that inflated the bubble to recent heights. But interest rates are on the rise. That is, debt is more expensive to bear. And rates have reached the point where they begin to drag… like sandbags weighing down a hot air balloon. The U.S. corporate debt bubble will likely burst due to tightening monetary conditions, including rising interest rates. 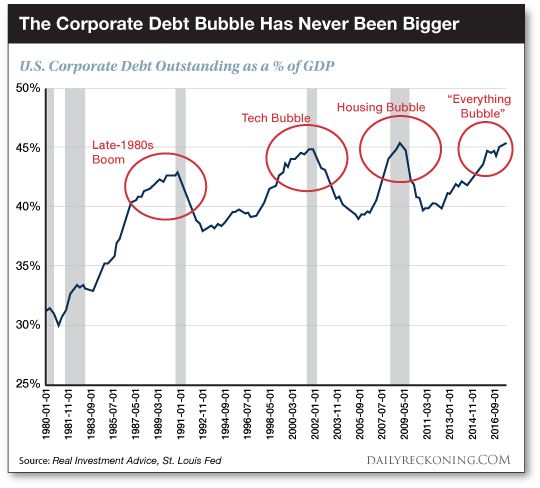 Loose monetary conditions are what created the corporate debt bubble in the first place, so the ending of those conditions will end the corporate debt bubble. 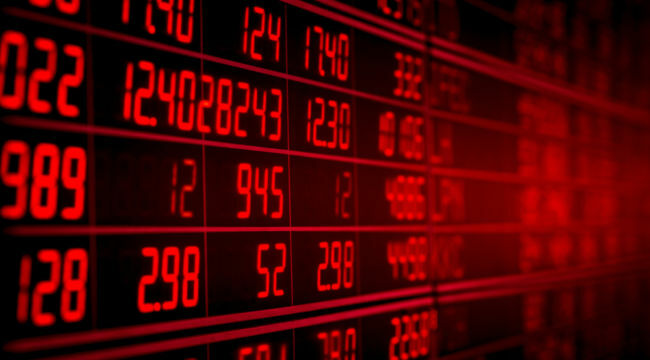 Falling corporate bond prices and higher corporate bond yields will cause stock buybacks to come to a screeching halt, which will also pop the stock market bubble, creating a downward spiral. There are extreme consequences from central bank market-meddling and we are about to learn this lesson once again. GE is “a relatively systemic company,” says David Meneret, founder of hedge fund Mill Hill Capital. GE’s terrifying recent credit meltdown may be the initial pinprick for the corporate debt bubble, but make no mistake — it is not an isolated incident. GE may be the equivalent to Bear Stearns in 2007 and 2008 — just one of the first of many casualties. Exactly how many is the question. And so a titan of good old fashioned American capitalism is reduced to junk.